There is something nice about seeing a 'kid' actor grow into a full adult and you just know we will continue hearing from him. Dev Patel was 20 years old when he made "Slum Dog Millionaire" and followed that with the "Best Exotic Marigold Hotel" and its sequel building up an impressive resume. This week he has opened in two movies those being "The Wedding Guest" and "Hotel Mumbai". I saw the former this afternoon. The film opens with Dev Patel, as Jay, a throwback to the actors of yesteryear stepping into a Hitchcock movie with an edge. He packs 4 passports, gets to his destination, buys 2 guns, duck tape and kidnaps a woman sleeping in a house filled with people and on the way out kills a security guard. The woman, Samira, played by Radikha Apte, was getting into a marriage she didn't want and arranged with her lover for this heist. Samira and Jay ride from one city to another in Pakistan and India, from Jaipur to Goa to Delhi, with each place more crowded, more cars, more overbuilding than is complained about in the USA! The scenes showing the country at its worst and most beautiful, the latter near the end of the movie which takes place at the beach, are a major part fo the movie. After the bride-to-be is kidnapped there are many red herrings concerning diamonds, scooters, money, men, chnaging passports, another killing just to name a few. The major thing is it leads to nowhere with the ending making very little sense. 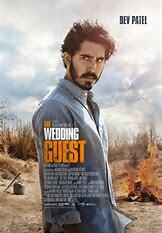 The director and screenplay writer, Michael Winterbottom, along with his cinematographer, Giles Nuttgens, makes "The Wedding Guest" an interesting film to watch while Dev Patel along with Radhika Apte have the chemistry to make the roles involve the audience no matter where it leads. "The Wedding Guest" reminded me of one of the old Warner Brothers double bills with this being the B movie. At a fast moving 93 minutes which, in my opinion, lead nowhere, itm has many positives about it with Dev Patel showing he has matured and can handle the tough guy roles! I didn't realize the Marigold Hotel guy was that particular actor. My favorite part of the India movies is the Bollywood dancing. But are they on their side when they are dancing?? ?